The Pressotherapy is a great help to the worst enemies of female beauty - fluid retention and cellulite, before whom also lean women are not spared. Every woman dreams of the perfect figure. But not many have been so easily endowed by nature. Most need to be keen and test in the fight against obesity and cellulite from the most diverse therapies. With more or less success. Pressotherapy is an ultra modern methods in aesthetic medicine with excellent results in cellulite, swelling, obesity, venous insufficiency, thrombosis prophylaxis, rehabilitation after sports injuries, after liposuction and surgeries. In principle it concerns with the pressotherapy to a mechanical lymphatic drainage, are degraded in the swelling of the veins and the lymph in the legs. Through an air pressure generated a gradual pressure on these vessels is exercised, the reflux is facilitated in the veins and improves blood circulation. The limbs feel immediately lighter. - Dystrophic processes in the muscle tissue. Both antenatal (prenatal) and postnatal (after birth), the disturbances. A dystrophy is then usually associated with functional limitations or malfunctions of the affected body regions. During a pressure therapy session, the patient puts on an inflatable suit. By the air pressure, a gradual pressure on the blood vessels is applied, the reflux is facilitated in the veins and improves the blood circulation. The limbs feel immediately lighter. The method is based on the method of Danish biologist Dr. Emil Vodder. A preset and can be programmed individually, wave-like pressure acts in sections specifically on the problem areas. A mechanical lymphatic drainage is suitable for all, where there is nothing against a manual massage. When thrombosis is however not recommended. The positive effect of this therapy that has made your entry into the world of beauty treatment 15 years ago, has further improved, since essential oils are applied before a meeting with draining effect. The circuit is so excited, fluid retention are dissolved and the body is purified. A subsequent massage one gains an even greater relaxation of the muscles, the body becomes more supple and the skin elastic and smooth. The pressotherapy does not take much time to complete. A session lasts an average of no more than 25 to 30 minutes and is performed every 2 to 3 days. Overall, about 10 to 15 sessions are recommended. The Pressotherapiegerät (3D Press) B-8320 is an ultra-modern and multi-functional device. It has 48 channels and a modern and practical LCD monitor. The unit permanently informed and very detailed information about its operating condition, in particular the status is visualized each air cushion of the suit. Furthermore, the operator of six permanently stored control programs to choose from. The pressure in the individual segments of the suit can be adjusted by the operator between 20 and 200 mm Hg. Also, a gradient can be realized. The compressor operates almost silently, and the state of the chambers can be monitored on the control panel visually. 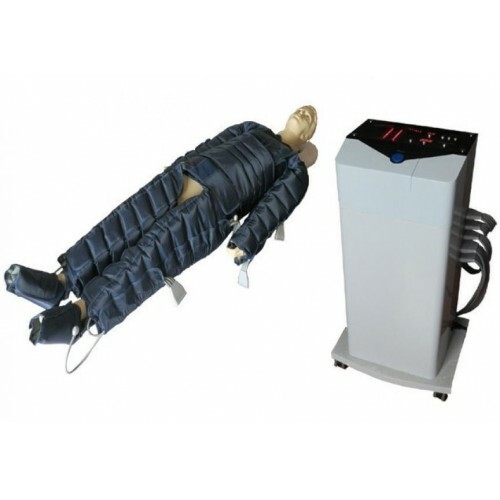 The machine includes a suit with independently inflatable chambers. It consists of boots, gloves and a belt for local massage and a printing blanket for a total pressotherapy. The Pressotherapiegeräts (3D Press) B-8320 has a wide range of applications, from cosmetic to medical applications.